Kate Erickson '05 and Langan Kingsley '08 paid a visit to campus this fall to speak to students about their experiences in the creative and entertainment world. Erickson and Kingsley joined Broti Gupta '16 for a panel discussion that was the inaugural event in a series presented by the English Department aimed towards students planning to pursue a career in a creative writing-related field after graduation. Erickson is a writer for the AMC series Fear the Walking Dead. Kingsley is a performer at the Upright Citizens Brigade Theatre in New York. Both women, who were English majors and members of Dead Serious, spoke at length about their time at Wellesley. Kingsley, who wrote a thesis and graduated with a double major, laughing, told the audience, "At Wellesley, there's a tendency to do everything all at once," but added, "in the real world your focus will narrow." They also addressed the need to take risks and fail, and discussed their "biggest and best failures." Erickson told a story about dealing with agents for the first time, while Kingsley talked about leaving her job in publishing midday to film sketches and go for auditions. The two, who were once roommates in New York, spoke and shared stories with ease, bouncing off of one another. After the panel, Erickson and Kingsley showed a smaller group of students their work on the screen. Erickson shared a scene she wrote from the BBC America show Copper that featured two women in conversation which, she said, passed the Bechdel Test (a test that determines how sexist a movie/TV show might be based on whether two female characters discuss only men). She also shared a "particularly difficult scene to film involving a cat." Kingsley, juxtaposing the dramatic mood of the BBCA show, shared a comedic sketch in a series called The Brothel in which she plays, as she described, a "Lean In-type" Brothel owner who is focused on rebranding the legalized brothel. Ultimately, both Erickson and Kingsley relayed the message that creative writing after graduation is hard, requires lots of risk-taking and failures, but is also incredibly rewarding. 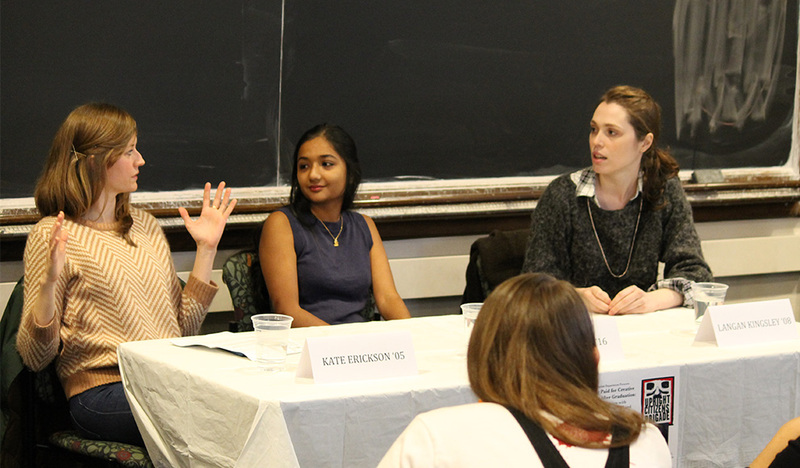 "This was a really fun and interesting opportunity to learn how Wellesley alums created careers out of writing," said Emily Johnston '18, who attended the talk. "I feel like I learned so much about pursuing a creative field." In an email to Gupta before the event, Erickson wrote, "We want to empower our students to recognize that being a writer means actively writing—and actively writing can, in fact, pay the rent. The creative writing major at Wellesley is about development of both craft and career." Story by Broti Gupta '16. Photo by Lisa Easley, English department.